Today, we're not only going back to Canada but also back to strong gel-pomades. It's been a long while since we've visited something like Suavecito Firme or Layrite Superhold. The only downsides to these products (aside from their intended characteristics) is that their endurance can be less than impressive. Especially when we compare it to their strength. I think 19Fifties Strong Hold Pomade is different. The design is just like the rest of their line. The only change for their Union Strong Hold Pomade is the color to red and no lie, it looks real good in red. It's a cologne type of scent, but more akin to something Axe would have released rather something a designer label would drop. The fragrance is very surface level and lacks a certain depth to it in the same way Suavecito does. It's very thick and similar to Suavecito Firme in the feel. Much easier than other gel-pomades of the same hold caliber. It's super easy to apply and work with while not even feeling super wet. Not super slick but they're is a dry pastiness that helps to keep hairs together. Damn strong. You can see the height in the photos. However, this is where the balancing happens with weight (and most significantly with gel-pomades). You have to consciously make sure not to let it become a cone head pomp. The hold is so strong that the hair will follow the stroke of the comb. It takes more work to pull it forward into a pomp. It's very intuitive to work with and has a average drying time. This is probably the most surprising aspect of this pomade. Today, even after all the activity, there was no need for restyling. It all stay together and didn't even move and inch during the day. You need water to reactivate. Because of the impressive endurance capabilities, 19Fifties Union Strong Hold Pomade receives my seal of approval. It's the only one to have been able to survive a day like this and not even flinch an inch. 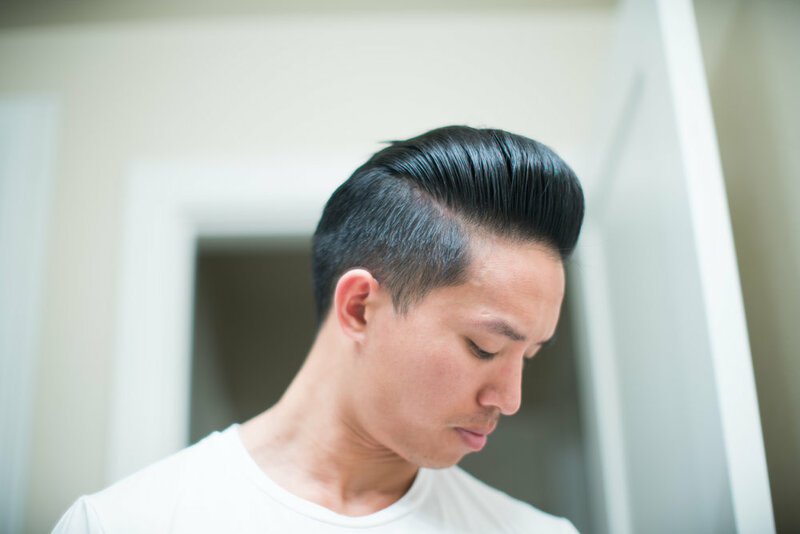 The rest of it's characteristics are above average and similar to many of the other popular gel-pomade choices. If you're interested, we offer the promo code THEPOMP to help you save some money when ordering direct from 19Fifties.